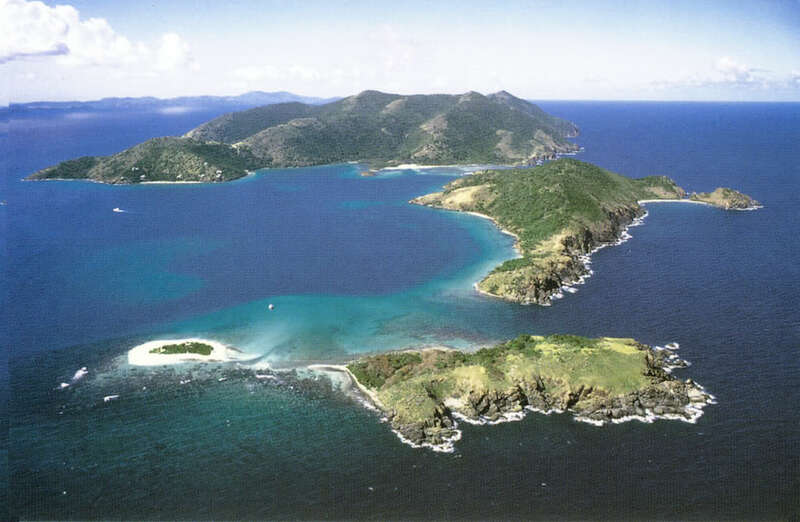 17th century Dutch pirate who made it his hideaway, the tiny mountainous island of Jost Van Dyke lies 3 miles off the northwest coast of Tortola. Little has changed since a Quaker colony settled here in the 1700s to farm sugar cane. In fact, most of the island's approximately 200 inhabitants (mainly members of the Chinnery and Callwood families) are descendants from the Quaker slaves. The island has only had electricity since 1991, goats graze peacefully over the green hills, and there is only one paved road; yet the charm of its residents and the uncomplicated simplicity make this unforgettable island an idyllic oasis on a Caribbean charter. The three main areas of activity are all on the south side of the island, with White Bay to the west, Great Harbour in the south-central area and rugged Little Harbour to the east. One Love Bar is run by Seddy Callwood and his wife Raquel. Seddy is Foxy's oldest son, and he loves to entertain with his magic tricks. One Love Bar is a thatched-roof beach bar decorated with buoys, fenders, life rings, nets, plastic bottles and other cast-offs that have been found on the beach. The interior is strewn with children's toys, making it a great family place to hang out! A bit down the beach is the Sandcastle, probably the best lodging on the island, although the hotel only updated to electricity in 1996. Its charming cottages are nestled near the beach and its restaurant offers dining by candlelight. No Caribbean charter to the BVI would be complete without heading to the Soggy Dollar Bar at the Sandcastle. Named after the wet bills brought by patrons who swim ashore to the bar, the Soggy Dollar (located right on the beach) is the inventor of the Painkiller, a strongly mixed drink made from dark rum, pineapple and orange juice, Coco Lopez and fresh nutmeg. After one drink, you will feel no pain; more than one and you will feel numb! Delicious sandwiches are available for lunch. There are plenty of BVI bar games to keep your family amused. Every Sunday, local musician, Ruben Chinnery, plays blues and Jimmy Buffet songs. Next door to the Soggy Dollar, you will find Gertrude's Bar and Boutique, offering drinks, snacks, gifts and hair braiding, as well as Wendall's Boutique for ladies clothing. Farther up the beach, stop at the tiny Jewel's Snack Shack. Run by Jewel Callwood, this is a great place for burgers, beer and the best Hebrew National hot dogs in the BVI! (Jewel, a transplanted New Yorker, married into the Callwood family). If you are on a Caribbean charter, the White Bay Suprette is a quick place to pick up suntan lotion, film, batteries, very basic provisions, soda, beer, some liquor and snacks. Right next to the White Bay campground, on the east end of the bay, you will find the Local Flavor Beach Bar, aka the Stress Free Bar. Decorated from top to bottom with shells collected off the beach, the Stress Free is proudly owned by Ivan Chinnery. The bar operates on an honor system- so mix your own drinks, keep your own tab and leave some money in the jar when you leave. Thursday nights you will find a delicious BBQ and live music. If enjoying sea breezes while quenching your thirst, limin' on a hammock and taking a stroll on one of the most perfect picture-postcard beaches in the Caribbean is not enough stimulation, at the far end of White Bay, check out BVI Sea and Land Adventures. You can rent a variety of water sports equipment, including jet boats, kayaks and water trampolines, as well as mountain bikes and ATV's. Half a mile to the east, beyond Pull and Be Damn Point, is the settlement of Great Harbour, aptly named for the spacious harbor that is sheltered by mountains. The beach here is fine for swimming and it is close to the laid-back Main Street, which is little more than a sandy track. Here you will find rooms for rent, a handful of bars, boutiques, a provision store and even an ice cream shop. The biggest draw, however, is Foxy's Tamarind Bar and Grill, tucked into the eastern corner. Foxy's is the bar that put Jost Van Dyke on cruisers' map. Tessa and Foxy Callwood are known by sailors and yachtsmen the world over. Together, this dynamic duo has built a fabulous business which has become a main attraction to this harbor and these islands. No Caribbean charter to the BVI would be complete without a visit to this quintessential beach bar. The bar is open to the elements and decorated with various articles of underclothing hanging from its thatched roof. What began as little more than a lemonade stand sized bar which was supposed to be open for only 1 day, Foxy's has evolved over the last 40 years into a major cultural force. Big annual events at Foxy's are his Old Year Party (a 3 day New Year's party which is so popular you can literally walk from one boat to another in the Harbour), the Halloween Party, the Cat Fight (catamaran race) and the Wooden Boat Regatta. A legend throughout the BVI, larger than life Foxy himself does impromptu shows, playing calypso and telling stories and jokes often at the expense and delight of his audience. Known for great local food, Foxy's has BBQ buffet nights on Fridays and Saturdays and live music Thursday through Saturday. Be sure to check out the rotis, flying fish sandwiches, and grilled fresh fish and lobster dinners. On the opposite end of the beach is Rudy's Mariner Inn. This establishment has 5 rooms, a bar and restaurant featuring seafood and live entertainment, and a small store in the back offering basic provisions. Next store to Rudy's, you will find the charming Methodist Church where, "All are Welcome" and the Jost Van Dyke Primary School- located behind the church. Next down the beach is Ali Baba's. This picturesque bar and restaurant specializes in BBQ ribs and chicken, conch, grilled local fish, drink specials (including their own rum punch) and a Monday night pig roast. At Wendell's World, get some delicious ice cream, stock up on provisions, or have one of the ladies braid your hair in the back beauty shop. In the center of the harbor is the Government Dock. In front of the dock is the Customs & Immigration and local Police station. You may need to hunt for an official since the station is rarely open. Behind this two-story building, is the local Ice House, which has ice by the block as well as cubes. Take the alley next to the Ice House to reach Christine's Bakery and Nature's Basket. Christine's Bakery is a quiet little place for great breakfast sandwiches and is especially known for the tasty banana bread. Nature's Basket has fresh fruit and vegetables from Ivan Chinnery's own plantation. Finally, be sure to take a stroll along Back Street that forms an arc through this interesting little community. While there, check out the wooden sloop behind Foxy's that is being built by the Jost Van Dyke Preservation Society. Just over a mile to the east of Great Harbour is Little Harbour- an incredibly quiet and picturesque anchorage. Those on a Caribbean charter know it for its 3 restaurants that offer great lobster dinners! On the west side, dine at either Harris' Place or Sidney's Peace & Love. Sidney's has been open for nearly 30 years. T-shirts of guests dangle from the ceiling. Lobsters are caught by Sidney himself, and both the lobster and chicken are cooked over an open fire according to an old family recipe. Meals are served with hearty helpings of rice and peas, coleslaw, potato salad and steamed vegetables. Thursday night is all you can eat lobster and Mondays and Saturdays are pig roast nights- each with live music. The bar is self service: mix 'em as you like 'em, just keep a tab! On the eastern side of the harbor is Abe's by the Sea. Owned by Abe Coakley, this small restaurant does not look like much from the outside. There is a tiny bar and just a few tables, along with a little store out back to do some simple provisioning. The pleasant surprise comes from the quality of food that emerges from the kitchen. Freshly caught lobster and fish is brought in daily. If you are lucky, you can actually meet the fishermen at the dock and select your dinner. The tables are meticulously set with pretty placemats and flatware. Besides fish and lobster, the menu also includes conch and chicken. Prices are reasonable and serving are generous. Meals include peas and rice, coleslaw or salad and delicious homemade desserts. Diamond Cay on Long Bay Beach, Jost Van Dyke is where Foxy's has opened Foxy's Taboo bar and restaurant. There are a few moorings and a substantial dock. From there, take the goat trail crossing the short peninsula separating Long Bay and a salt pond through waist-high wild sage bushes to the "Bubbly Pool." This geological delight is one of the BVI's Nature's little secrets! This spot is like a natural Jacuzzi. The rock formation on Jost Van Dyke's rugged northern coast funnels waves through a very narrow passage into a small natural pool that "bubbles" as the waves crash in. It is about five feet deep and fun for the whole family. Little Jost Van Dyke offers a small anchorage except when the surge is up. There is good snorkeling along the south side. On the north side, there is a dive site called, Twin Towers. In the springtime, expect to see schools of reef squid. Green Cay is a superb daytime stop with excellent snorkeling on the reef that extends south of the cay. Off Green Cay's oceanside, The Playground is an exciting dive site for swell-less days. A series of pinnacles covered with brightly colored sponges and branching hydroid fans shelter abundant marine life such as angelfish and glassy minnows, patrolled by jacks, snappers and schools of barracuda and tarpon. Sandy Cay is located to the east of Jost Van Dyke. Owned by Laurence Rockefeller, this is an ideal tropical island dotted with palm trees on wide, gently sloping beaches. There is a botanical tour on a small path that encircles the island and affords spectacular views of the surrounding islands. 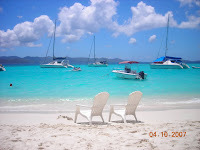 Sandy Spit is a superb day anchorage laying immediately south of Green Cay and within "spitting" distance of Jost Van Dyke and Sandy Cay. This is an fantasy-like little island that is encircled by a picture perfect 360° white sand beach, some green vegetation, and only two coconut palms. It is a fun place to sun bath, picnic and explore, but the snorkeling is not great. 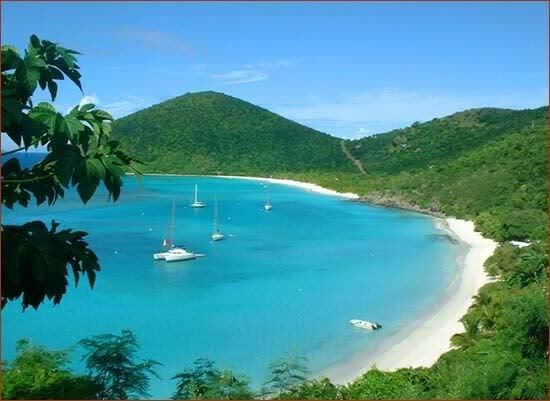 Jost Van Dyke is a special island with incredibly friendly residents and a casual way of life. It is a world apart from any of the other British Virgin Islands. For years, it has been a favorite destination of yachties because of its unpretentiousness. Discover this idyllic tranquil retreat. 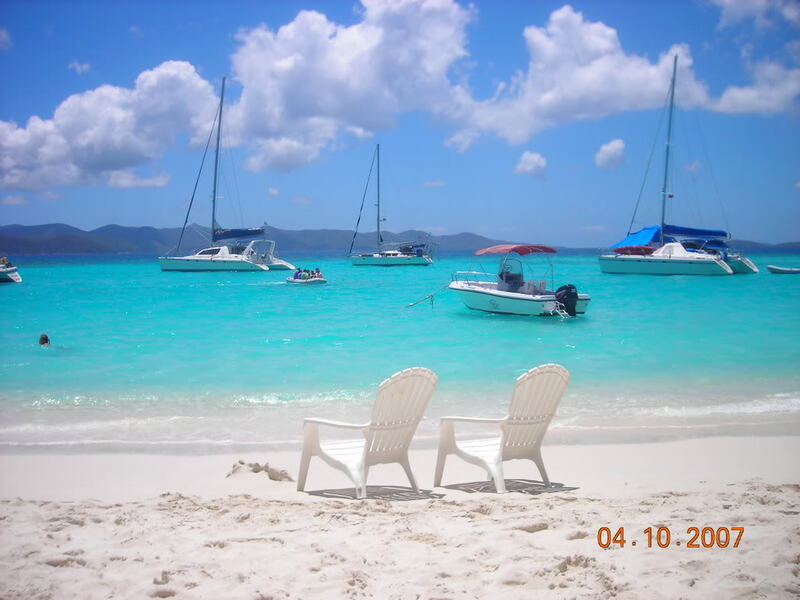 Joie de vivre awaits you on Jost Van Dyke.